Blood rushes to the surface of your skin as your heart races and adrenaline pounds through your veins. A bead of sweat rolls off your cheek and splashes on the floor. In an instant, the games have begun. Shrieks echo off the walls as you wade through a pile of refuse, fighting for the highest number of points. You’ve been chosen for The Garbage Games. 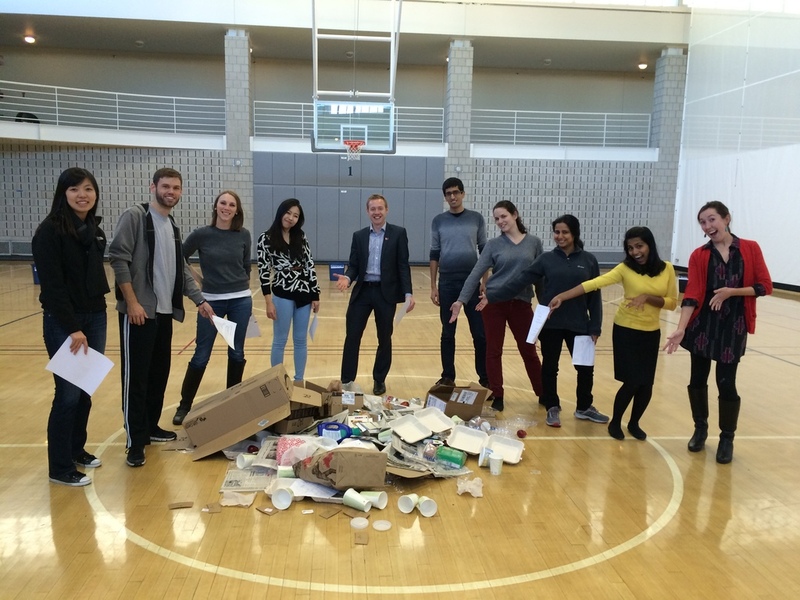 On Wed., Nov. 4, the Student Sustainability Associates’ (SSA’s) Garbage Games are back on for a second year. Five RCs from each section are chosen (or volunteer as tribute) to compete in an hour-long event designed to teach waste reduction at HBS. You can race to sort garbage, build a junkyard sculpture and whip out your waste reduction trivia knowledge (hint: the plastic sandwich/cookie wrapper in your brown bag lunch is compostable) to increase your section’s chance at snagging the Green Cup, which comes with a $1000 cash prize and points towards the SA cup. This initiative is part of the SSA program, now in its 11th year, which is the school’s peer-to-peer education program that encourages sustainable living and working at HBS. One student is hired per section to share information on waste reduction and recycling, energy conservation, water awareness and Earth Month. The ten SSAs chosen this year have diverse backgrounds – ranging from architecture to mechanical engineering – but they are all determined to build a greener future. “Sustainability is a serious issue that demands our attention and efforts. 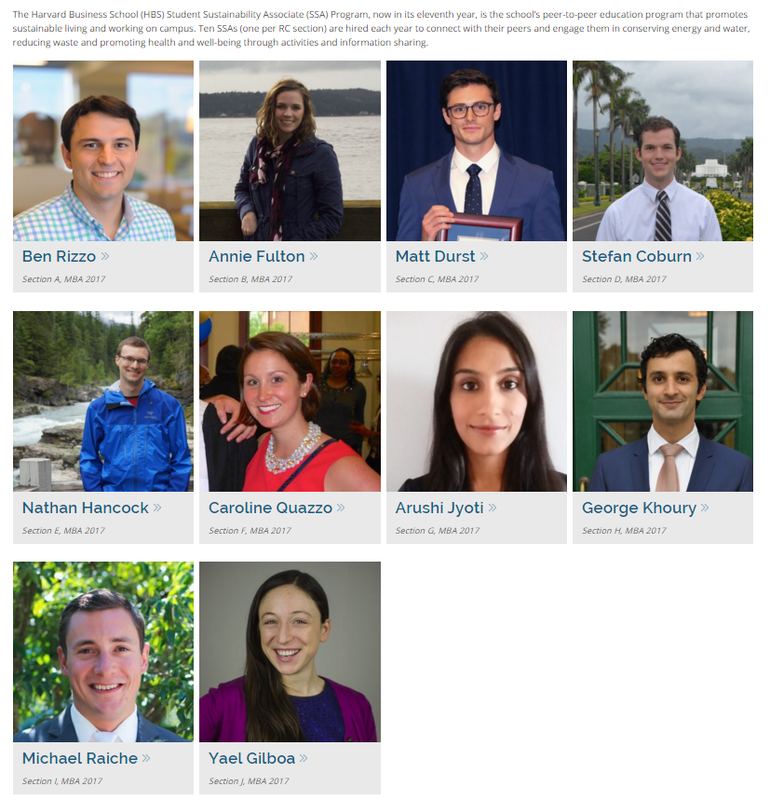 I wanted to be involved here at HBS because we are all going to be leaders in various industries in the future and this is an issue that requires a coordinated effort on all fronts,” says Stefan Coburn, Section D’s SSA. In addition to influencing their peers to go on to be green leaders, the SSAs assist in HBS’s mission to continuously improve sustainability on campus. Since 2006, the school has achieved a 45 percent reduction in GHG emissions (including growth), a 21 percent drop in energy consumption and a 21 percent reduction in waste. While these metrics are promising, there is still room for improvement. “Coming from the manufacturing industry, I have noticed many areas in which resources can be preserved and emissions can be reduced,” says Michael Raiche, Section I’s SSA. One such area is water consumption. The University, as part of the Harvard Sustainability Plan, has set a goal to reduce water use by 30 percent by 2020 (with a 2006 baseline). In order to achieve this ambitious target, HBS Operations has been implementing several strategies that include upgrading fixtures, piloting lower flow toilets and showers and studying the irrigation system. Additionally, two of the SSAs, as part of their SSA Independent Project, will be doing a widespread assessment of water usage on campus to find opportunities for conservation. 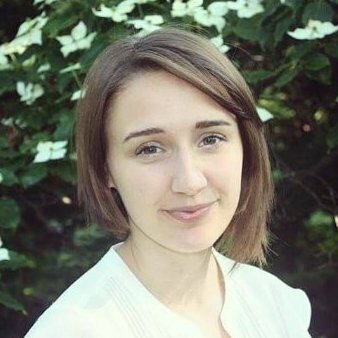 “We continue to benchmark against other schools and organizations to ensure we are using the best practices and the best technologies for a sustainable campus,” says Leah Ricci, the Assistant Director of Sustainability and Energy Management at HBS. However, it is essential that all students make sustainable decisions in order to reach and surpass the school’s environmental goals. So, as suggested by your SSAs, turn off your lights, put on a sweater, eat less beef, and – everyone’s favorite – reduce, reuse, recycle. When: Wed., Nov. 4 at 3 p.m.